The Muhammad Ali/Joe Frazier fight on March 8th, 1971 was billed as the “Fight of the Century” as it marked the first time that undefeated boxers would fight each other for the heavyweight title. Frazier entered the bout as the WBC/WBA champions with a perfect 26-0 record and 23 KO’s. Ali was the Ring/Lineal heavyweight champion with an impressive 31-0 record and 25 KO’s. The fight did not disappoint as both boxers battled it out for 15 grueling rounds and Joe Frazier was declared the winner via a unanimous decision. The second paragraph reads in part: “WITNESSETH: That said party of the second part hereby agrees to enter into a Boxing contest at No. “Madison Sq. Garden” Street, in said City of “NY” New York, on “8” day of “March” 19 “71”, for “15” rounds, to a decision, with “Joe Frazier” of the City of “Phila.”, and the State of “Pa.” as his opponent, at a weight not over “Hw.” pounds,”. The contract for Ali was for “$2,500,000” and this contract sets up the deposit in the sum of “$5,000.00”. 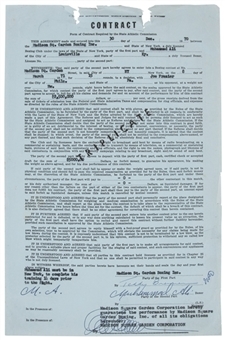 Ali’s signature has been signed in bold blue pen on the bottom right portion of this contract above the “Party of the Second Part” line and has “Boxer” and the end of his signature. This is one of the nicest Ali signatures with his later career and post career signatures display the effects of the onset of Parkinson’s Disease. 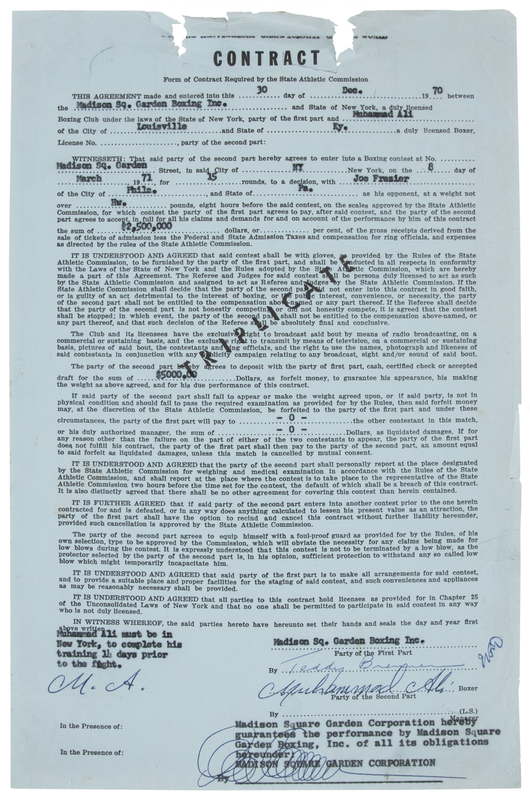 This contract also has the blue pen signature of Teddy Brenner, longtime Madison Square Garden executive known as the “Matchmaker” for his aptitude in bringing the best bouts to Madison Square Garden. Brenner’s signature appears directly above Ali’s signature and below the “Madison Sq. Garden Boxing Inc.” and “Party of the First Part” lines. This contract is in good overall condition with pre-punched holes made to be stored in a legal packet. Around the pre-punched holes are minor tears, fold and crease marks, along with some edge wear, but these marks do not detract from the quality of the signatures displayed at the bottom of the page. This contract can be compared favorably to the 1978 Muhammad Ali/Leon Spinks fight contract that sold for $35,850 in 2015. The contract offered here has much higher quality Muhammad Ali signature and the Ali/Spinks contract was sold prior to Ali’s passing in 2016. This historic contract comes with a LOA from JSA for the signatures.